What unites [Xi Chuan’s] lyric poems and his essay-poems is that they all carry a sense of the world’s plentitude and of the world’s puzzlement. The plentitude itself is bewildering and the bewilderment has a certain beauty. 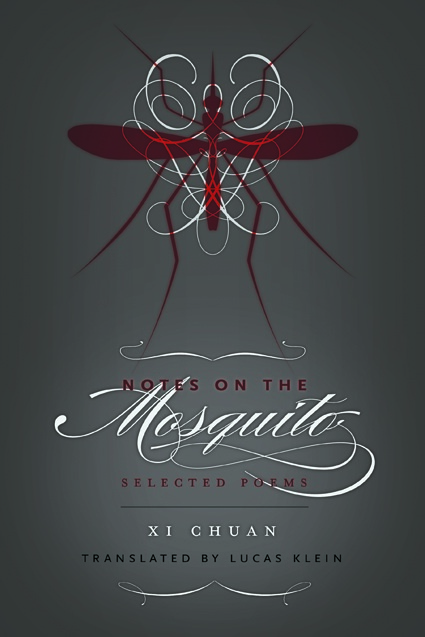 Notes on the Mosquito: Selected Poems introduces English readers to one of the most celebrated poets of contemporary China. Gaining recognition as a post-Misty poet in the late ’80s, Xi Chuan was famous for his condensed, numinous lyricism, and for radiating classical Chinese influences as much as Western modernist traditions. After the crushing failure of Tiananmen Square and the death of two of his closest friends, he stopped writing for three years. He re-emerged transformed: he began writing meditative, expansive prose poems that dismantled the aestheticism and musicality of his previous self. Divided into two sections that hinge around this formal break, Notes on the Mosquito offers the greatest hits of a deeply engaging poet whose poems intertwine the mountains and roads of Xinjiang with insects and mythical beasts, ghosts, sacred spirits, and a Sanskrit brick. Xi Chuan’s surprising poems reach into tight corners of mind and matter, impersonal but intimate, new to be heard but also oddly familiar. An impressive voice — bold and calm.